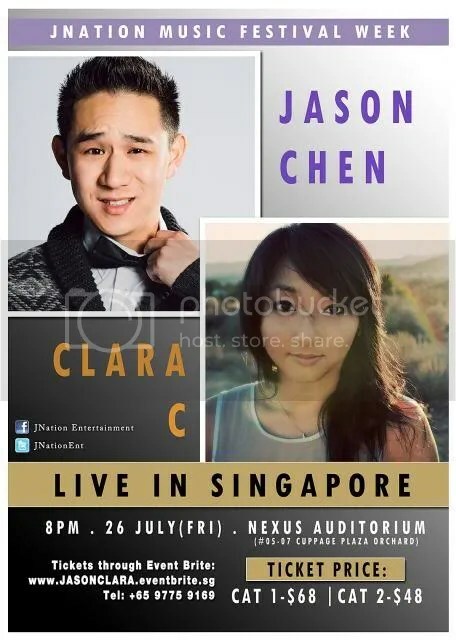 In conjunction with JNation Music Festival Week, JNation proudly presents two YouTube sensations, Jason Chen & Clara C.
This will be Jason’s second visit to Singapore this year. Early this year, he was in Singapore for a solo gig at the Hard Rock Cafe. Based on the previous gig, fans can expect Jason to perform English and Chinese covers and originals. Guitarist and singer-songwriter Clara C rose to fame when she won Los Angeles’ Kollaboration 10, KAC Media Juice Night, and ISA 2009. She has since been doing covers with other YouTubers such as Tiffany Alvord and Joseph Vincent. Singapore fans, you are in for a treat! You will have the chance to catch both Jason and Clara at ONE same gig. Yes, you can catch both talented YouTube sensations at the same gig. How awesome is that?